It won’t be news to anyone that the world is changing at pace. Whether it’s the international rules based order being threatened or the threat and opportunities provided by emerging technologies such as the 3 As (AI, Algorithms and Automation) along with the unknown quantities of machine learning – change is all around us. 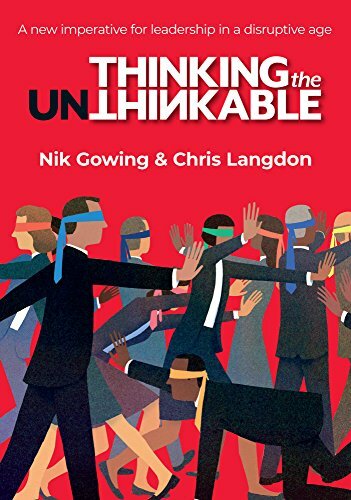 Thinking the Unthinkable focuses on so called ‘unthinkables’, the often unpalatable events that lead countries and organisations into potential existential crises. From the crisis in Ukraine in 2014 to the British Army’s 5 years of internal reflection, the key narrative in this book is that institutionalisation has left leaders blind and, or, unwilling to think about true existential issues. So, why should any follower of the Wavell Room read this book? Firstly, the Wavell Room gets a mention…but more about that later. Secondly, this book includes many first-hand accounts of leaders facing significant crises, often existential issues for their organisation, because their organisations lacked the ability to think about what was occurring to them. Furthermore, there is a significant chapter dedicated to the institutional changes that have occurred for British Army during the tenure of General Sir Nick Carter. The message running through this book is clear. It is a warning that whatever your area or discipline – national governance, banking, media, communications, defence etc – all are under threat in some way. The world as we know it, either deliberately through state actions in Ukraine or the impact of social media and communications, along with a growing world population, is changing how the world functions. This is not the inter-generational change the world has seen before. It’s rapid, often divisive, almost always disruptive and no institution or government is too big to fail. For those serving in the Army over the past decade the period of change ushered in by General Carter won’t have gone unnoticed. Drinking policies, mandated training and a new era of inclusivity have all been used to try and change the Amy’s culture. The Army is a unique organisation and, as one Whitehall observer noted, ‘Everyone calls for more flexible, more adaptive thinking. Well you can call for it, but it won’t necessarily happen’. I won’t spoil the story but, the authors of Thinking the Unthinkable have had the opportunity to speak to General Carter at length, allowing him to explain his key issues and the threats which he faced when trying to drive the change programme for the Army. Even if you disagree, and many of you will, hearing the perspective of the then Chief, and now Chief of Defence Staff, should always be interesting to service personnel and it certainly is in this case. So, onto the mention of The Wavell Room. Explaining the utility of empowerment and change from the bottom up the Wavell Room is highlighted, along with Dragon Portal and BrAIN, as allowing the youth to have a voice. It’s interesting to note that these groups came about because ambitious ‘young’ people were frustrated and felt they were not being listened to. This is slightly at odds with the suggestion in the book that these groups were produced as a result of the changes implemented by General Carter, although as an example it is still valid. Young people in any organisation have the ability to question and challenge, and this should be encouraged. General Carter goes onto mention that he welcomes the debate within the Army up until the point a decision is made. I wonder if all his starred ranked staff have heard that message loud and clear…? Thinking the Unthinkable explains at length that failing to speak truth to power, risk deferrers and fear of career limiting moves (CLMs) are all attributes often associated with those clambering for the top jobs. These ‘blockers’ are the ones who stop the good ideas and mask the truth to those in power and are often the real cause of institutional failure. One idea that resonates throughout several of the examples is the impact that millennials along with generations Y and Z are having on long standing institutions. Many CEOs are quoted identifying that young people today don’t want money and prestige, wanting to making a difference and aspiring to make the world a better place are key drivers for them. These drivers clearly don’t fit well into the hierarchal ladders that many key national institutions and large corporate companies use to allow competition for their top jobs. However, the ability to question and ask why, often identified with a ‘needy’ millennial generational approach, is beginning to be harnessed by large corporations as they offer the challenge function that is often provided by expensive consultancy firms. Why, after all, would you spend significant amounts of money utilising consultancies when you can empower and develop young subordinates who are more than willing, and often more than capable, to act as the challenge function for your organisation. This book is not a how to guide. For those destined for greatness it does not provide a list of buzz words or check sheets that leaders should monitor to avert a crisis. It does question and raise an understanding of what the issues may look like and encourages leaders to talk and discuss. www.thinkunthink.org is an online forum set up to encourage this debate. Thinking the Unthinkable does not provide answers but, the authors hope, it is a catalyst and a focal point to start that discussion. A junior Army Officer with operational experience in Afghanistan and Russian facing operations. A passing interest in academia and a keen interest in how the Army needs to change to survive in the future.